Writing scripts for dynamic mesh generation can be annoying and full of gotchas, but very powerful when successful! It took me a while to feel comfortable with it, so I thought I’d compile some of the tricks I picked up into a tutorial. None of these ideas are specific to volumetric or multi-view displays, but the results tend to be some of the best-looking content for those mediums. 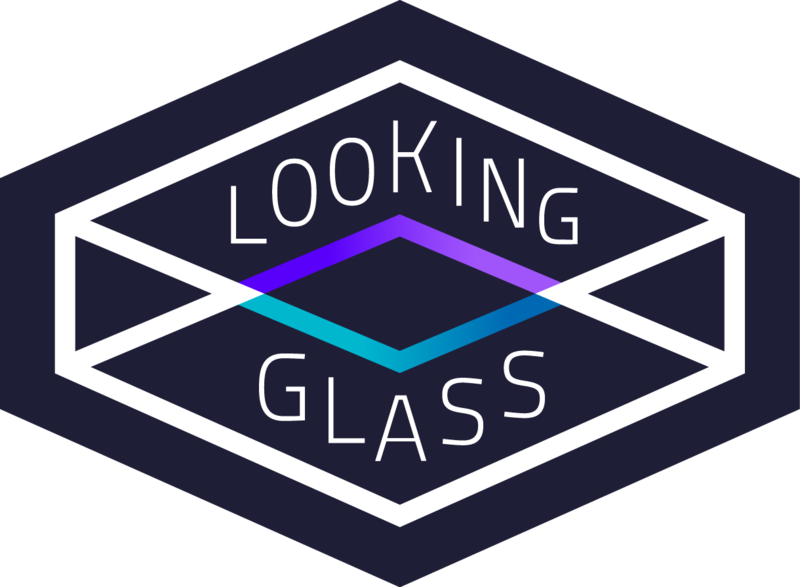 This tutorial assumes you know a few basics of coding in Unity, such as what a Mesh Filter and Mesh Renderer are, how to define a class, and how to use for-loops. This will be a 3 part series, so don’t miss parts 2 and 3. In a blank scene in Unity, create an empty GameObject, and name it “Mesh Generator” (or whatever you’d like). Add a Mesh Renderer and Mesh Filter component to it. Also add a new component and call it MeshGenerator. Open up the MeshGenerator script. The first thing we want to do is define a custom class called MeshData. This is where we’ll store the lists of verts, tris, and uvs, so we can more readily manipulate them. Also included is a ClearAll() function for convenience, if or when we want to start building the mesh from scratch again. It might seem redundant to do this: doesn’t the built-in Mesh class already have these properties? Yes, it does, but it is bad and/or impossible to edit them in a progressive manner like we’ll be doing. 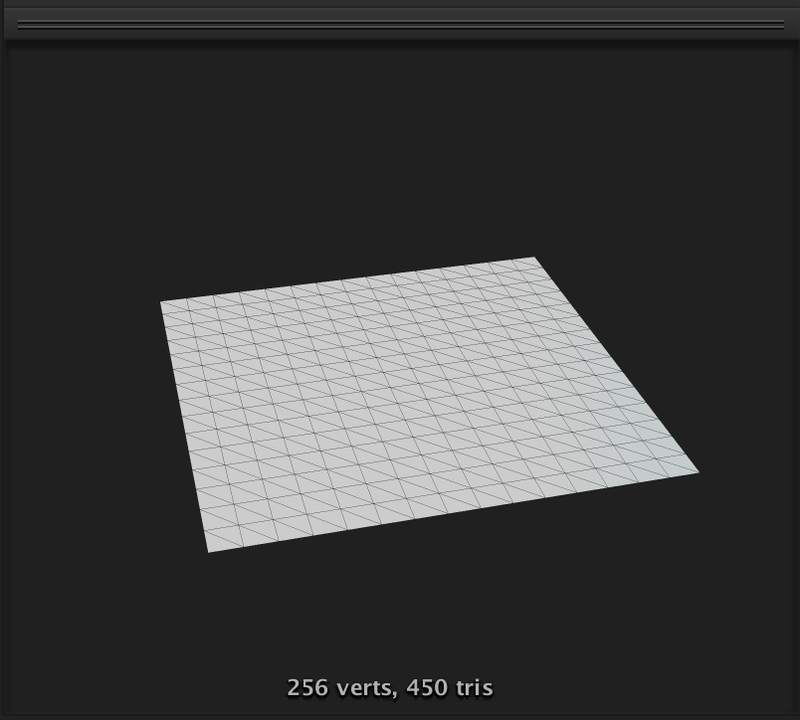 Instead we keep adding to our MeshData lists, and when we’re all done, we set the Mesh properties from those lists. I assure you this is a regular thing that people do all the time. We can create our MeshGenerator class properties now. Add a field for the instance of our MeshData and initialize it. In our Awake() function, we can set the reference for the meshFilter and create a new mesh for it as well. Now we’re ready to make some meshes baby! These define how long and how wide our mesh is. By default I set them to 3, but you can adjust them in the inspector window. Good! 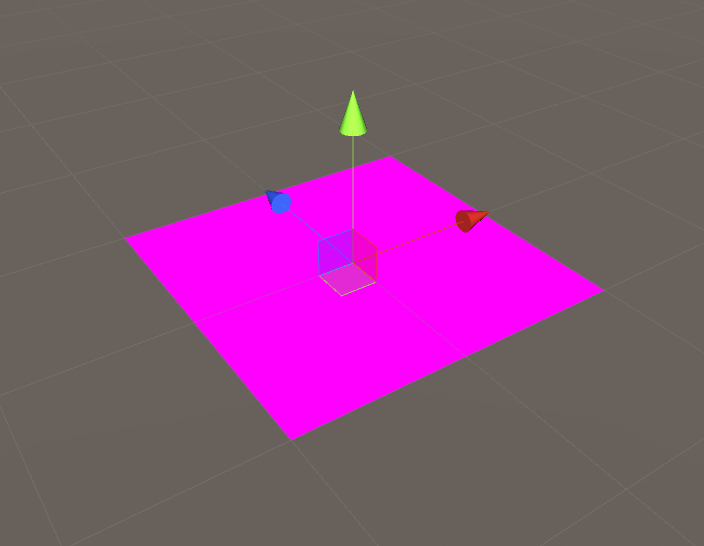 Now we have a 3x3 array of vertices. Now for the fun part: stitching these into triangles. If you’ve never dealt with mesh data before, it might seem confusing that the tris are listed as a 1-dimensional array of integers. But it’s actually very clever! You can assume that since a triangle is always made up of 3 points, the ints in the array represent the index of the verts that make up each triangle, three at a time. 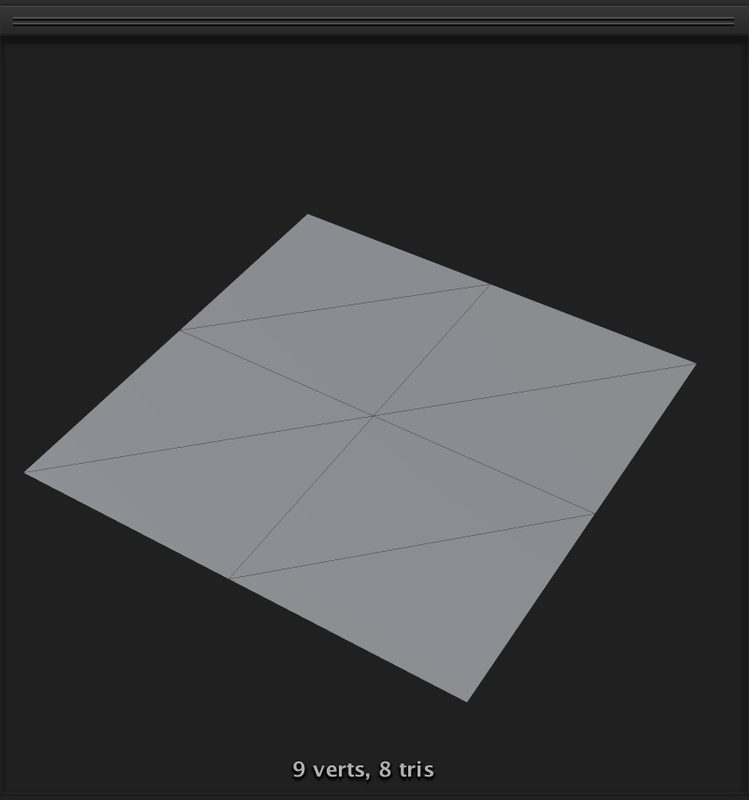 So, for example, this set of tris: [0, 1, 2, 2, 3, 0] instructs the mesh interpreter to make one triangle out of vertices 0, 1, and 2, and a second triangle out of verts 2, 3, and 0. We want to stitch two triangles for every vertex, giving us a quad. 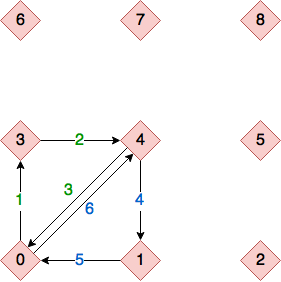 In this diagram, the red diamonds are vertices, and the arrows represent the steps in drawing our triangles. For this set of triangles, we’d be adding [0, 3, 4] and [4, 1, 0] to the tris list. But knowing the hard numeric values is not very useful to us! We need to know the indices of these verts in a dynamic sense, so it can be iteratively built for us. Let’s add some conditionals. Think about the triangles we are drawing: they wouldn’t be possible until we reach the 4th vertex in the loop. So as long as x == 0 or z == 0 (i.e. we’re still on the first row or first column), we shouldn’t be stitching triangles yet. Since we’re using vertex 4 in this diagram as a starting point, what would that value be considered dynamically? It’s x + z * width. How do we know that? Well, z iterates once x is finished with its loop, so for every z incrementation, the index is greater by that many times width. Think of it like this: to move up or down on the imaginary “y” axis of this 1D array, we add or subtract by whole widths at a time. v4 - 1 is the obvious answer, and thankfully the correct one. What about v1 and v0? Here’s where it helps to really internalize this concept of traversing a 1 dimensional array which represents 2d coordinates. To move up and down on the vertical axis, we’re simply adding or subtracting by width. Now let’s add those triangles to the list in the order they are shown in the diagram! Finally, outside of your nested for-loop, once everything is done, remember to set the actual verts and tris of the real mesh. I set them on sharedMesh because that prevents us from instantiating an entirely new mesh if we are doing this in Edit mode. You will see in the preview at the bottom of the inspector (you may have to drag it up from the bottom to see it) that we have created a quad with tris in the order we want them! that’s it but those are very good things. Thanks for reading and if you have any questions (or, likely, corrections) message me or reply here! This is great material. Will you be continuing?